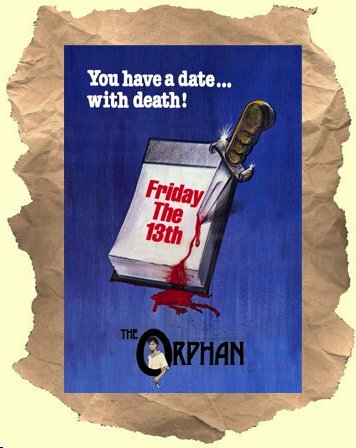 FRIDAY THE 13th: THE ORPHAN (1977) – H.H. Munro must have turned over in his grave at this adaptation of one of his short stories. This quasi-horror film was re-released in 1979 as just The Orphan and despite the original title it has no connection to the Friday the 13th series of slasher flicks. At least, no REAL connection. I’m surprised some unscrupulous distributor never tried sneaking this into theaters in the 1980s as a “prequel” to the slasher movies by presenting the insane young boy in the movie as the grandfather of Jason Voorhees. Even so the title makes it hard not to think of our wealthy young protagonist “David” (Mark Owens) as an ancestor of the hockey- masked slice and dice man from Crystal Lake. In the 1920s David’s mother accidentally shoots his African Big Game Hunter father Kevin to death during an argument about his frequent overseas trips. David not only witnesses this but sees his mother put the gun in her mouth and kill herself immediately afterward. Next David gets VERY disturbed when a presumed family member (an uncredited Christopher Lloyd in a “blink-and-you’ll- miss- him” appearance) forces him to kiss his dead father as he lies in his coffin. The young man’s Aunt Martha arrives to take care of him (and yes, obscure movie buffs, she sometimes does dreadful things). Turns out Martha was dating David’s father before he callously dumped her to marry her sister. Martha takes her resentment of the father out on David and even chews him out about a cough he inherited from dear dead Dad. I’m sure you can tell where all this is headed. His father’s old hunting attendant, an African named Akin (pronounced “Akeen”) who teaches David about VooDoo practices and lets him smoke out of a hookah with him. A furious Aunt Martha fires him for that last little escapade. With these kinds of influences in his life David predictably goes nuts. He starts playing Solitaire with Tarot decks, praying to a stuffed monkey named Charlie like it’s a god, smacking away a Communion wafer that a priest gives him and reciting blasphemous parodies of prayers. He also squirrels away all kinds of crazy knick- knacks in a shack on his family’s estate – a shack he’s converted into a creepy hideaway (again putting the viewer in mind of Jason Voorhees) and takes to honing his skills with a knife (ditto). David soon starts slashing up loaf after loaf of bread (?) and eventually, VERY late in the movie our psycho stabs the maid to death for having an affair with bearded weirdo Bill. Worst of all Aunt Martha threatens to send him to an orphanage because of his increasingly deranged behavior AND accidentally kills his dog. Needless to say Aunt Martha, who is like an even crazier version of Nancy Pelosi but without as much plastic surgery, is next on David’s “kill” list. When David hallucinates a hand from his father reaching down from Heaven to comfort him … just the hand and arm, nothing else. David talking to his stuffed-monkey “god” Charlie about the birds and the bees while using a banana and a potato as visual aids. A formal funeral meal where the shot is framed like a goofball version of the Last Supper … if the Last Supper had featured a boom mike intruding on the scene. David dressing up as Aunt Martha – complete with makeup and earrings – then skulking around talking like the Wicked Witch. All this plus the most HILARIOUS rectal thermometer scene this side of The Creeping Terror. And did I mention David’s pet chicken named Apple Betty? Guess what happens to her. Yep. At any rate this attempt at a horror movie for the arthouse crowd is a lot of fun to laugh at because of all the inherent weirdness, but if you’re looking for lots of killings and lots of blood this is NOT the film for you. WARNING: Loaves of bread WERE harmed in the making of this film. Creepy movie from the sounds of it. This review made me laugh so hard!